Provocative essays on feminism, race, revolution, and the future. Eagles carried off the guests of honor. The world's leading feminist sf convention just won't fit into Memorial Day weekend. Some forty contributors—too many to list here—take WisCon 2007 a step further. 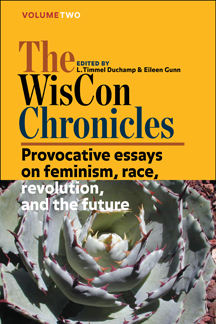 "The second volume (Wiscon 31 - 2007) continued in this style, often pairing two or three articles/responses together so that different opinions could show how the same event inspired diverse reactions. Naaman Gobert Tilahun, finding himself the only person of colour on a panel about colonialism, honestly discusses the emotional experience of taking part in the discussion, and some of the issues it raised in his mind that the rest of the panel did not necessarily take into account. A series of pieces about a controversial 'Romance of the Revolution' panel (featuring two male and two female panellists, three of whom were American, one British, all white) raise all kinds of fascinating issues: K. Joyce Tsai shares her shock and anger at the way the discussion treated 'white' and 'non-white' revolutions differently, particularly in discussing the agency of the revolutionaries. A partial transcript of the panel itself can be compared to Tsai's reactions, showing how different an unemotional view of the panel is to her self-confessed emotional reaction, though at the same time supporting her memories. In 'Science Fiction in the Year Zero' panellist Chris Nakashima-Brown makes it clear what his priorities were in the panel, while female panellist L. Timmel Duchamp sums up many of the issues that were at play during the panel and many others at Wiscon, with more general analysis of how male and female panellists often approach topics differently, and how easily panels can be hijacked in the direction of the 'View From Nowhere'; that is the assumption by white, middle class 'first world' men that their perspective on the world is the universal default and thus both neutral and comfortable to everyone. Anyone who has ever tried to discuss the messy issues of racial and gender perspectives as they pertain to SF Convention Panels would really benefit from reading Duchamp's fascinating essay, which looks at how hard it can be to maintain feminist discourse in a discussion panel, even at a feminist convention. "Another fantastic feature of volume two was a collection of short responses collected from a variety of writers who were asked to answer the question of how to deal with racist and sexist material when faced with it in writing workshops. The variety of response were really thought-provoking and interesting. I also enjoyed Creating the 'second self': performance, gender and authorship, another brilliant essay by L. Timmel Duchamp, this one discussing the women SF writers who felt it necessary to write as if they were men, and Follow the Yellow Brick Road, a paper by Catherynne M. Valente which discusses the female heroes of Alice in Wonderland, The Wizard of Oz and The Nutcracker in relation to the myths of Inanna and Persephone, goddesses of the Underworld.